HAPPY HOLIDAYS from all of us at the Pennsylvania National Horse Show! Harrisburg, PA -- October 20, 2018 - Swiss Olympic veteran Beat Mändli bested a six horse jump-off to win the marquee event at the Pennsylvania National Horse Show, the $132,000 Prix De Penn National on Dibatsja, owned by Grant Road Partners, LLC. Mändliwon this class in 2014 and he wasn't sure he would win again. "I didn't expect to win. I was already happy with my first round because I have a few big weeks ahead of me, so I just wanted to put in a nice round and see what happened and it turned out great for me," said Mändli. "I have been based in North Salem, NY for five years and I have come here all five years because I really like the show. It's a really good start for indoors, with enough space to ride and everything is so well organized. Overall it's a really nice show." Leslie Schillat of Malvern, PA rode SLF Destiny to the win over 29 finalists in the $10,000 North American League (NAL) Adult Jumper Final, Presented by SmartPak at the Pennsylvania National Horse Show. The pair turned in two fault-free rides and a jump-off time of 35.991 to claim the win. Fairy Tale and 15-year-old Daneli Miron won the $12,500 North American League (NAL) Low Junior/Amateur Jumper Final, presented by HorseFlight at the Pennsylvania National Horse Show on Saturday afternoon. The pair led the competition from start to finish. They were first in the ring in the preliminary round, first to return in the jump-off and at the end, took first place. 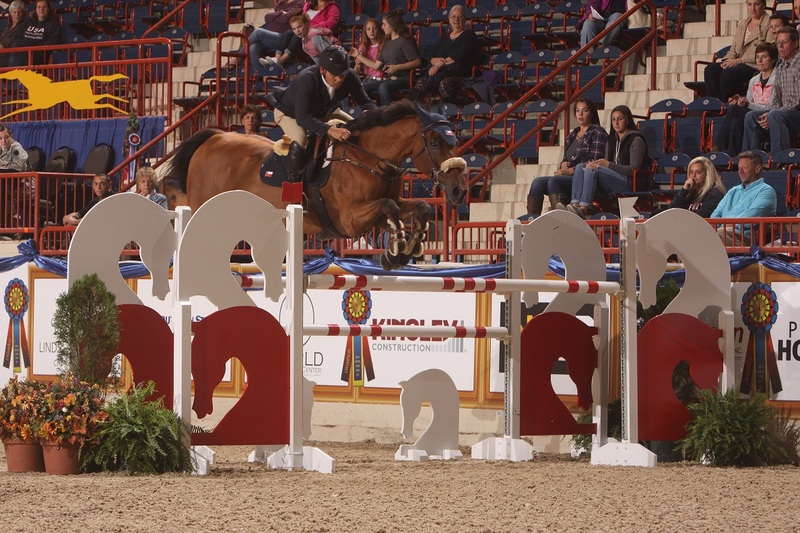 Harrisburg, PA -- October 20, 2018 - Grace Debney, 14, Hampden, MA and Byolga, owned by Emily Reder, capped an already successful year with a win in the $10,000 North American League (NAL) Children's Jumper Final, presented by EquiFit, at the Pennsylvania National Horse Show on Saturday afternoon. The pair has dominated the division in 2018. They finished on top of the year-long regular season standings and then won at Capital Challenge, an impressive accomplishment since this is Debney's first year riding jumpers and first time participating in the NAL program. "It feels great," said Debney. "I tried not to have any expectations. We had a really good Capital Challenge, so I just wanted to come in with no pressure, but this was really the goal for the year." 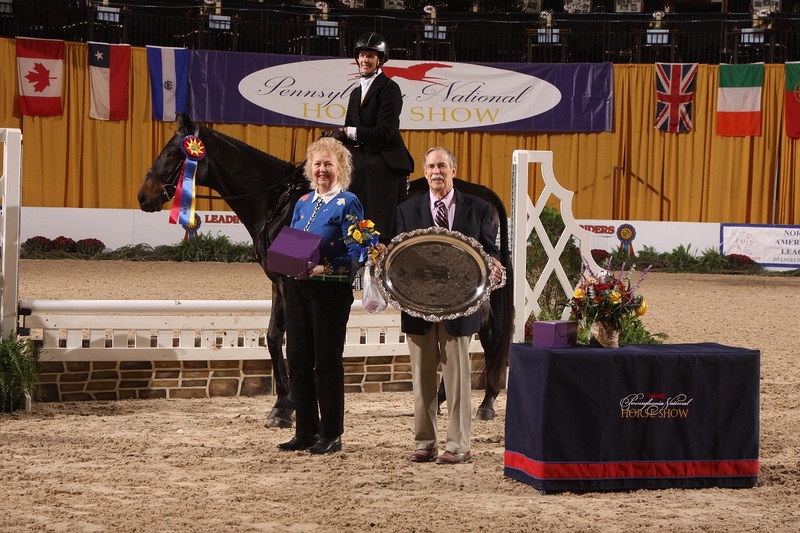 Ellen Toon will have her name inscribed on the Legend Has It Perpetual Trophy for the fifth time as she and her 11-year-old mare, Mirror Image, were named Grand Amateur Owner Champions at the Pennsylvania National Horse Show, being held at the Farm Show Complex in Harrisburg, PA.
Harrisburg, PA -- October 19, 2018 - Beezie Madden, the two-time Olympic Gold Medalist and reigning Longines FEI World Cup Champion, scored her second victory in as many days on Jiva, owned by Abigail Wexner, at the Pennsylvania National Horse Show winning the $35,000 Keystone Classic Speed Stake, sponsored by the World Equestrian Center on Friday evening. 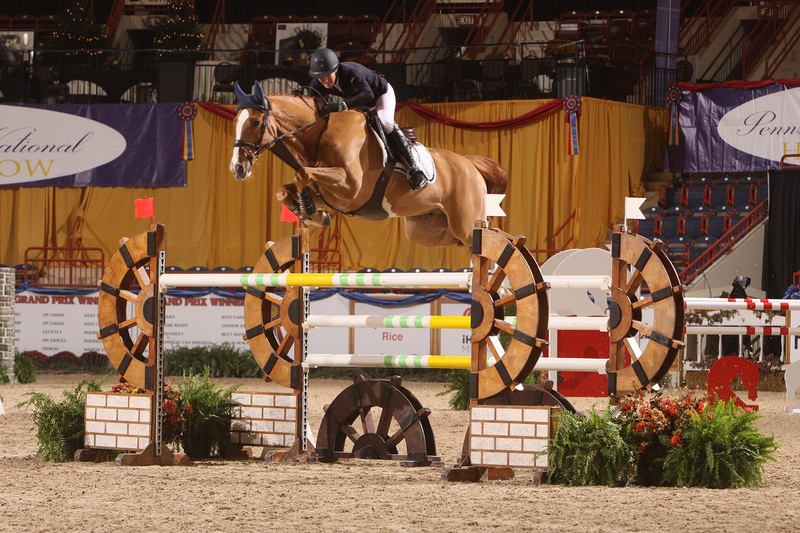 The pair also won the $35,000 1.45m Harrisburg Sprint, sponsored by the Tanzola Family, the day before and as a result were crowned Open Jumper Speed Champions, receiving the Showday Farm Challenge Trophy, donated by Mr. and Mrs Charles Ziff. The 3rd PNHS Foundation Therapeutic Riding Championships were showcased as part of “Foundation Friday” at the Pennsylvania National Horse Show, held at the Farm Show Complex in Harrisburg, PA. Over the years, the has awarded numerous grants. In 2017, The PNHS Foundation awarded 36 grants supporting therapeutic riding and equine rescue totaling $40,000. For Martha Ingram and Lyons Creek Bellini, the Pennsylvania National Horse Show is full of first- time memories, and Friday was no exception. The pair took home the Grand Championship for Amateur Owner 3’3” Hunters. In recognition of their performances over the two days of competition in the 3’3” Amateur Hunter Riders 18-35 division, the pair were named Champion on their way to being named Grand Champion. This is the first time Ingram won a Championship at the PA National in all the years of competing at the event. Harrisburg, PA -- October 18, 2018 - Kelli Cruciotti defeated two-time Olympic Gold Medalist and reigning Longines FEI World Cup Champion Beezie Madden by one tenth of second to win Thursday's $50,000 Pennsylvania Big Jump, sponsored by Wilmington Trust - A Division of M & T Bank. 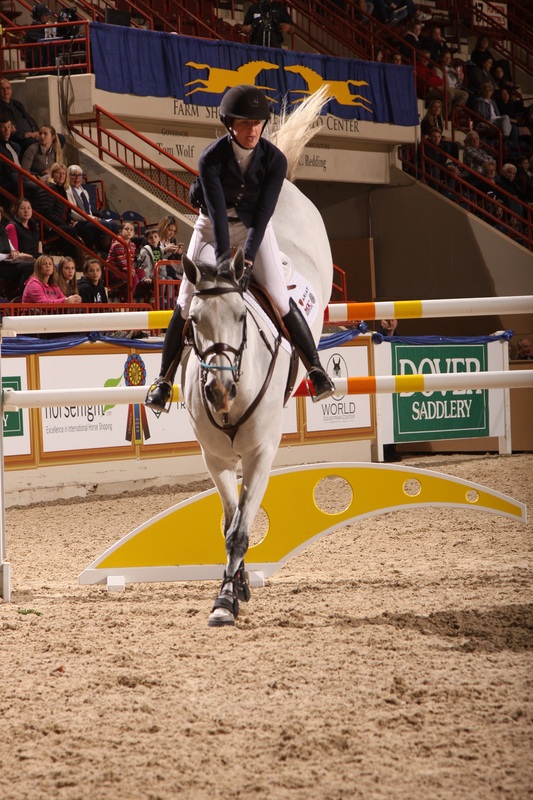 Riding Hadja Van Orshof, the 21 year old resident of Elizabeth, CO, could not believe that she won such a prestigious event at the Pennsylvania National Horse Show. 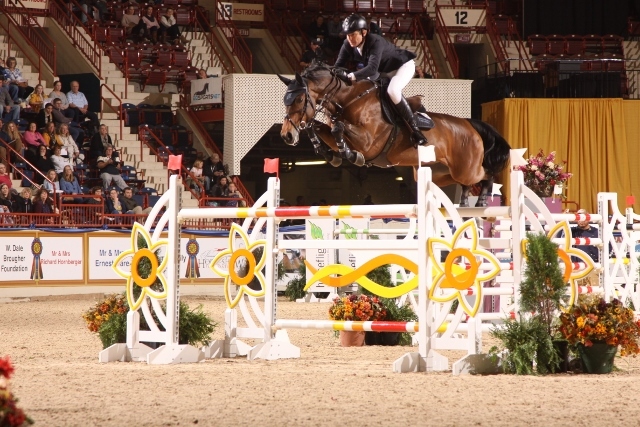 Just Ask, a bay 9-year-old Warmblood gelding, owned by Roberts Stables LLC, trained by Patty Rogers and ridden by Jeff Gogul, won the Grand Hunter Championship for their performance in the 3’6” Green Conformation division at the Pennsylvania National Horse Show, running October 11-20, 2018 at the Farm Show Complex in Harrisburg, PA.
Harrisburg, PA -- October 17, 2018 -- Stepping up from the opening weekend's junior division to a field with olympic veterans, Brian Moggre continued his memorable Pennsylvania National horse show winning the $15,000 Dash for Cash on Wednesday Evening. Adding the FEI victory to his gold medal wins in the prestigious Dover Saddlery/USEF Hunter Seat Medal Final and Neue Schule/ USEF Prix des States Team Championship, Moggre defeated the field of 25 on MTM Vivre le Reve, owned by Major Wager, LLC, in his first FEI outing. Just So and rider Peter Pletcher were in perfect form as they won two classes over fences to claim the 3’ Green Hunter Championship at the Pennsylvania National Horse Show, being held at the Farm Show Complex in Harrisburg, PA, October 11-20, 2018. Harrisburg, PA -- October 16, 2018 -- Ashleigh Glorioso of Burke, VA, and Southern Willcaptured the Championship title in the Sidesaddle Division, sponsored by the Hornberger Family, at the Pennsylvania National Horse Show on Tuesday evening. With a total score of 18 points, Glorioso and her 10-year-old Thoroughbred received the Grand Duchess Perpetual Trophy, donated by Mr. & Mrs. Richard L. Hornberger and Miss Patty Perkins. 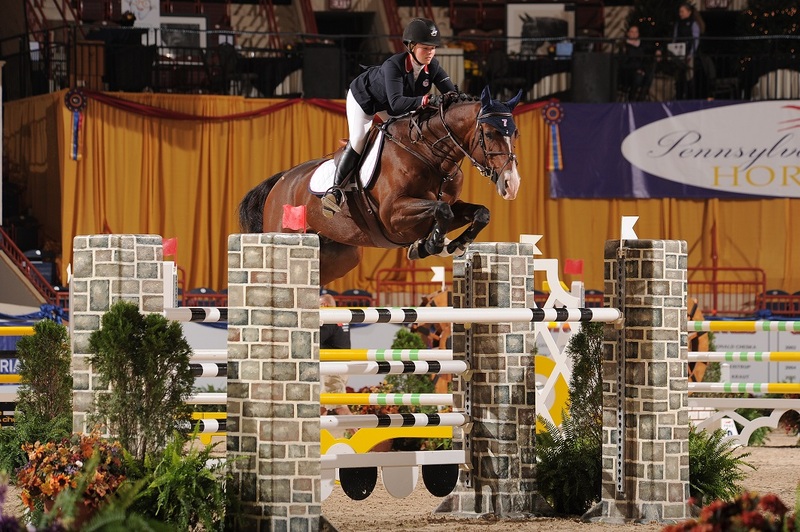 Stephanie Bulger’s Hemingway, ridden by Sandra Ferrell, galloped away with the 3’6” Green Hunter Championship. The pair won three classes in the division and placed second in the remaining two classes. For their performance in the division, the pair was named Grand Green Hunter Champion and received the Kimberton Hills Challenge Trophy. History and pageantry were evident in the arena at the Pennsylvania National Horse Show, as competitors in the Hunt Night classes brought their unique style, foxhounds and fun-loving attitude to this traditional facet of riding. 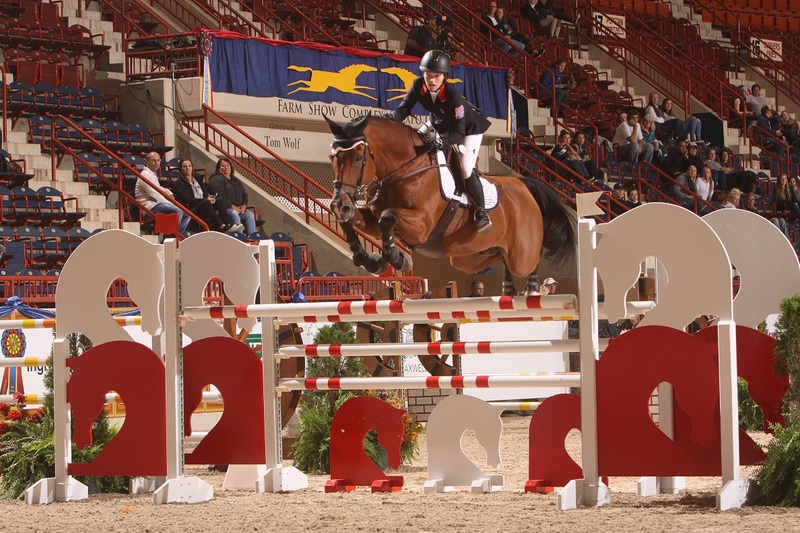 Sienna Pilla and Pop Rocks won the North American League (NAL) Children’s Hunter Final and Allison Cederberg and Zero Tolerance won the NAL Adult Hunter Final held during the Pennsylvania National Horse Show in Harrisburg, PA, both with a total two-round score of 170.00. 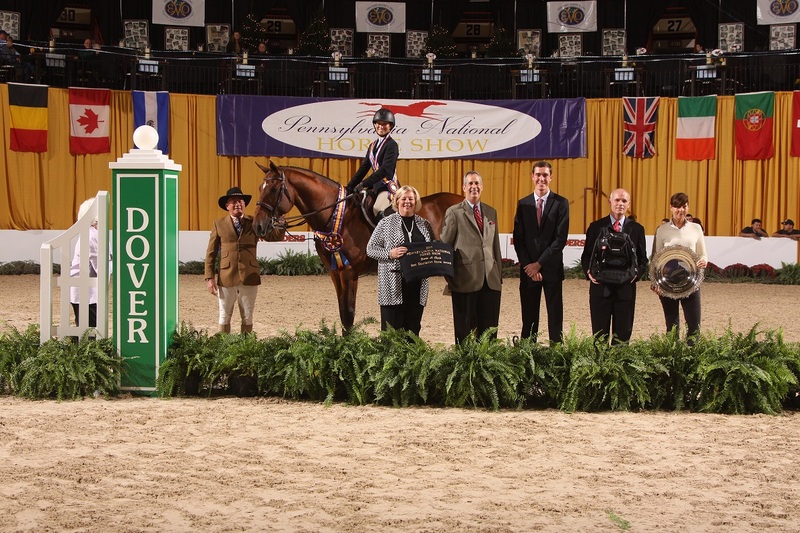 After a year of qualifying, 238 riders started their quest for the top prize in the Dover Saddlery/USEF Hunter Seat Medal Final at The Pennsylvania National Horse Show. All the hopefuls have one goal in mind, to add their name to the illustrious list of riders who have preceded them, names like Steinkraus, Chapot and Morris. Family Fun Day was in full swing at the Pennsylvania National Horse Show (PNHS) as children and their parents filled the stands to watch pony hunters of all sizes and colors compete for champion ribbons while also enjoying story hour and craft activities. You could hear a pin drop in the main arena as Sophie Gochman and Carola BH, rode towards victory in the 2018 Neue Schule/USEF Jr. Jumper Champion title. 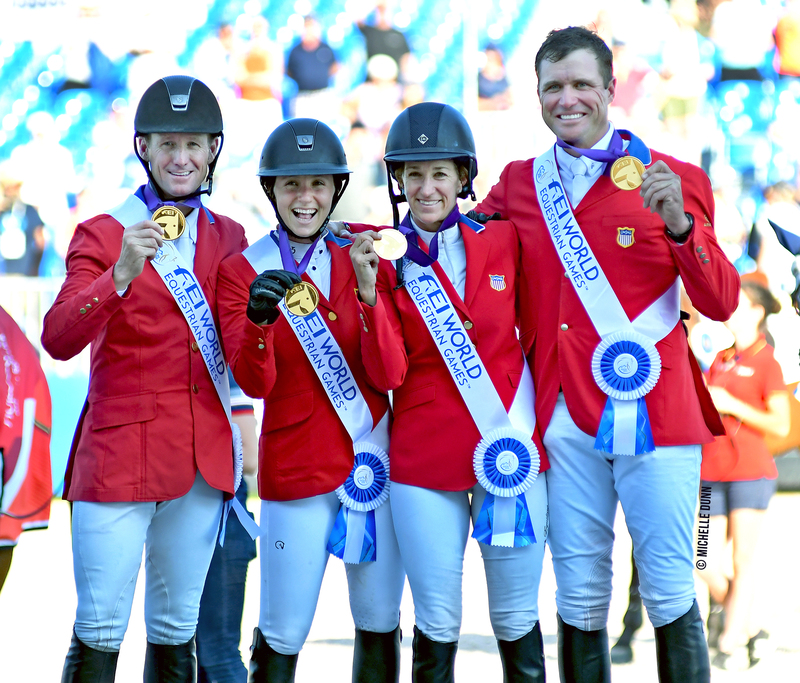 Harrisburg, Pennsylvania - October 12, 2018 – Defending their historic 2017 team win, Zone 7 were once again victorious, bringing home team gold in the 2018 Neue Schule/ USEF Prix des States Team Championship at the 73rd Pennsylvania National Horse Show. 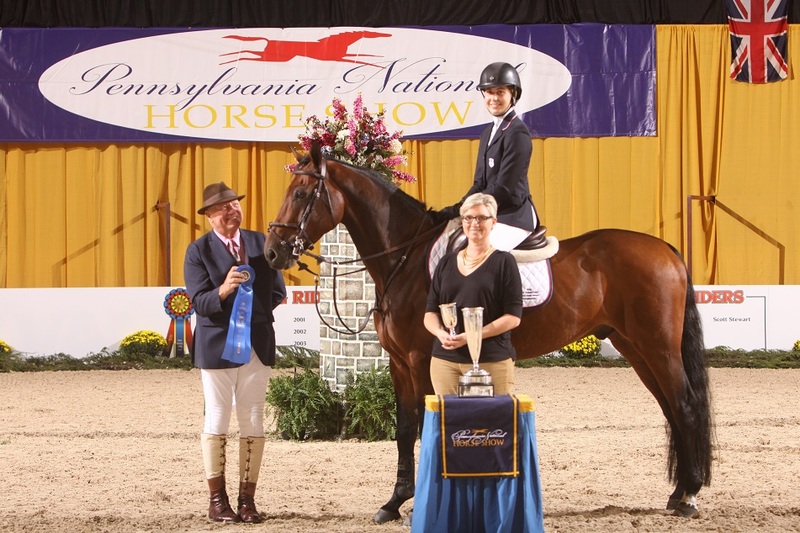 The first Champions were crowned in the hunter divisions at the Pennsylvania National Horse Show, held at the Farm Show Complex in Harrisburg, PA, and Emma Kurtz, Hudson, OH, walked away with two titles. 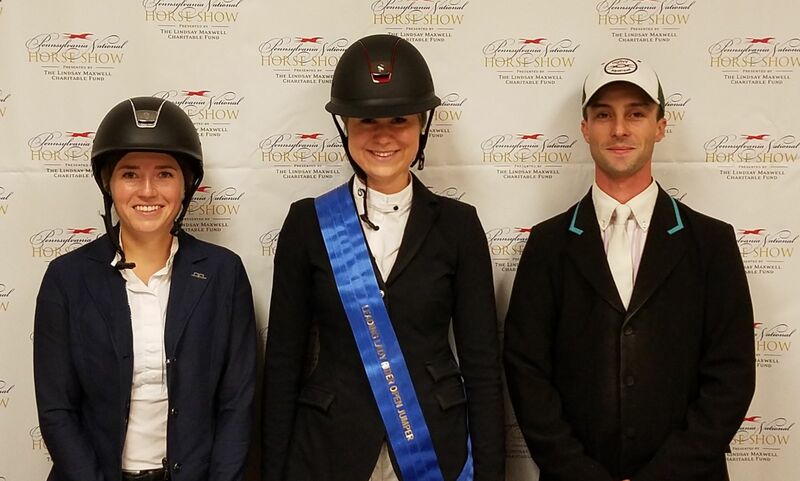 Harrisburg, Pennsylvania - October 11, 2018 – ­Precision was key for Madison Goetzmann and Prestigious as they took home an early win in the first phase of the Neue Schule/USEF Jr. Jumper Championships at the 73rd Pennsylvania National Horse Show. Emma Kurtz is excited to be at the Pennsylvania National Horse Show, a venue that she has been to many times in her young life. She has been named champion and earned blue ribbons at the PA National many times on both ponies and horses, but this Junior Weekend is special. Kurtz is showing in the Junior Hunters, is riding a jumper in the Neue Shule/USEF Prix de States competition and is vying for the Dover Saddlery/USEF Hunter Seat Medal Finals all in one weekend. Harrisburg, Pennsylvania – October 1, 2018 – McLain Ward and Adrienne Sternlicht, two members of the United States’ Gold medal Show Jumping Team that made history at the 2018 FEI World Equestrian Games (WEG), head a list of nearly forty top riders from five countries entered in the 73rd annual Pennsylvania National Horse Show (PNHS). Harrisburg, Pennsylvania – September 24, 2018 – The 2018 Pennsylvania National Horse Show (PNHS) is proud to welcome and thank leading sponsors for its 73rd annual event. Harrisburg, Pennsylvania – September 20, 2018 – The 2018 Pennsylvania National Horse Show (PNHS) is proud to welcome and thank their Presenting Sponsors for its 73rd annual event. 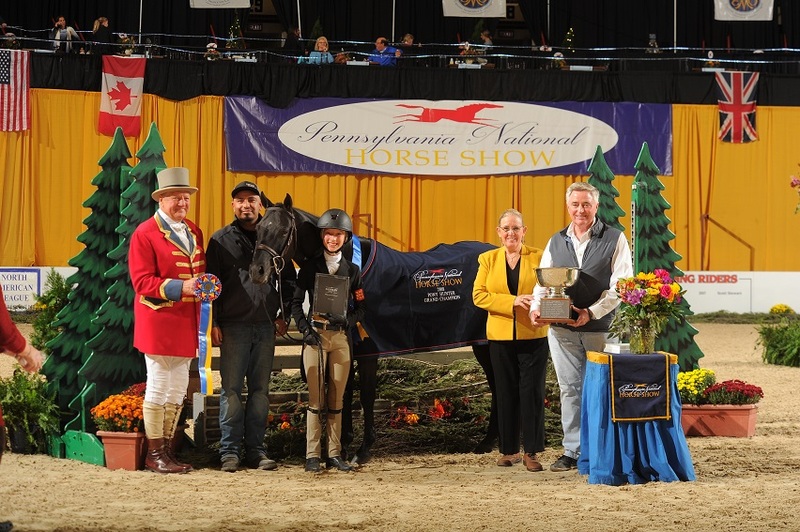 Harrisburg, Pennsylvania - September 12, 2018 - The 73rd annualPennsylvania National Horse Show (PNHS) is excited to announce it will host special guests, therapeutic riding champions, the "Therapy Horse of the Year" and a Silent Auction on Foundation Friday, October 19 at the Pennsylvania Farm Show Complex and Expo Center in Harrisburg. Harrisburg, Pennsylvania – September 06, 2018 – Olympic medalist Leslie Burr Howard and the late Jack Stedding, a renowned trainer, will be inducted into the Pennsylvania National Horse Show Hall of Fame at the Pennsylvania National Horse Show (PNHS). Shop for 2018 Pennsylvania National Horse Show Tickets Online Now! ACCEPTANCE POLICY REVISION - Green Hunter 3' and 3'3"
HARRISBURG, PA – The Pennsylvania National Horse Show is pleased to announce that starting with the 2018 show, October 11-20, all hunter sections, including the Green Hunter 3’ and Green Hunter 3’3” will use USEF Points to determine acceptance. Reserve Space Now for the 2018 PA National Horse Show! HARRISBURG, PA – Vendor booth space is now available for the 2018 Pennsylvania National Horse Show (PNHS), held from October 11 to 20th, 2018 at the Farm Show Complex in Harrisburg, PA. With space on both the upper and lower concourses, there are options for any size business and budget. Improvements and Upgrades at PNHS for 2018! HARRISBURG, PA – The Pennsylvania National Horse Show is pleased to announce its partnership with Footing First LLC for providing international competition quality footing for the Equine Arena (schooling ring) for the 2018 competition. Specifically, Footing First will provide, install and oversee the placement of footing in the 145’ x 245’ Equine Arena. Mimi Gochman, 13, from Palm Beach, FL, showed everyone just how it is done in the $10,000 North American League (NAL) Low Junior/Amateur Owner Final at the Pennsylvania National Horse Show presented by the Lindsey Maxwell Charitable Fund, held at the Farm Show Complex in Harrisburg, PA.
Gochman was the only rider of the 29 starters to jump the course without penalty or time faults, not once but twice. She went 10th in the order with Everest De Muse, owned by Evergate Stables LLC, and 26th with Caleno 3, owned by Gotham Enterprizes LLC. Both horses were clear to advance to a jump-off, but Gochman chose to save her horses and decided the winner by their times on course. Everett De Muze finished the course in 64.273 seconds for first and Caleno 3 had a time of 68.371 for second place. Harrisburg, Pennsylvania - October 21, 2017 - Lindsey Tomeu of Wellington, FL, and Bonapart won the $10,000 NAL Adult Jumper Final Presented by SmartPak at the Pennsylvania National Horse Show, presented by the Lindsay Maxwell Charitable Fund, at the Pennsylvania Farm Show Complex in Harrisburg, PA.
Tomeu was one of 14 entries from the starting field of 29 to qualify for the jump-off by riding clean over the first-round course designed by Bernardo Cabral of Portugal. Last to go in the jump-off, the 23-year blazed over the course fault-free in 27.776 seconds to beat the time of 28.761 turned in by Paige Kouimanis on Lexus and claim the NAL Final win for the third time. "It's very exciting. I cried when I realized that I won. It's incredible," said Dugas. "I have the best horse in the whole world, he's amazing." Stephanie Danhakl and her stallion First Light won the Amateur Owner 3’6” Grand Hunter Championship, the Amateur Owner Hunter 3’6” Championship for Riders 18-35 Years of Age, the Legend Has It Perpetual Trophy and the Wintarra Ring Perpetual Trophy at the Pennsylvania National Horse Show, presented by the Lindsay Maxwell Charitable Fund, at the Farm Show Complex in Harrisburg, PA.
"This class was our main focus for "Chops". This was the one that I really wanted him to do well in," said Ashe. "We won the first night in the 1.45m class. I didn't go all out with him then, but I wanted to get him acclimated because I never showed him indoors and then he was amazing again tonight." The 2017 Therapeutic Riding Championships were showcaseded as part of Foundation Friday at the Pennsylvania National Horse Show, presented by the Lindsay Maxwell Charitable Fund, held at the Farm Show Complex in Harrisburg, PA.
Riders qualified for these Championship classes by competing in any one of five qualifying competitions held at Columbia Riding Club, Columbia, PA; Thorncroft Equestrian Center, Devon, PA; Friendly Riding Club, Denver, PA; Gettysburg Riding Club, Gettysburg, PA; and Leg Up Farm in York, PA.
Stephanie Fabiano, Mechanicsville, PA, and her horse Neato, took home the Grand Amateur Owner 3’3” Hunter Championship and the Art Dunphy Perpetual Trophy for their performances at the Pennsylvania National Horse Show, presented by the Lindsay Maxwell Charitable Fund, held at the Farm Show Complex in Harrisburg, PA.
Fabiano and Neato, an 8-year-old gelding, won the Amateur Owner 3’3” Hunter Championship for Riders 18-35 Years of Age on their way to the Grand Championship. The pair, who have only been together since January, and did not start showing in the Amateur Owner divisions until May, won or placed in every class they showed in for the title. Based out of Buffalo, New York, but originally from Harrisburg, PA, Alfano and Candid won three of the over fences classes in the division and placed second in the other. They took fourth place in the hack and second in the model, giving them the points needed to be named Champion. Harrisburg, PA - October 18, 2017 - Samuel Parot and Couscous van Orti sped to victory in the $10,000 Dash for the Cash, sponsored by Geraldine Nesbitt, at the Pennsylvania National Horse Show, presented by The Lindsay Maxwell Charitable Fund. The Olympic veteran from Chile had little time to familiarize himself with the Farmshow Complex as he had only arrived one hour before the start of the class and he was the first to ride the course. "This is my first time at Harrisburg. I think it's unbelievable, the place is "wow!" said Parot. "This is a wonderful show. We only just arrived here a couple of hours ago, but I am very happy to be here and it's super to win. It's not easy to win so when you do, it's really great." Victoria Colvin piloted John and Stephanie Ingram’s Snowday to the 3’ Green Hunter Championship and the PNHS Green Hunter 3’ Perpetual Trophy for their performances in the 3’ Green Hunter division at the Pennsylvania National Horse Show, presented by the Lindsay Maxwell Charitable Fund, at the Pennsylvania Farm Show Complex in Harrisburg, PA.
Harrisburg, PA - October 17, 2017 - Ashleigh Glorioso, 25, of Burke, Va., and Turtle were crowned champions in the Sidesaddle Division, sponsored by Mr. & Mrs. Richard L. Hornberger, at the Pennsylvania National Horse Show, presented by The Lindsay Maxwell Charitable Fund. 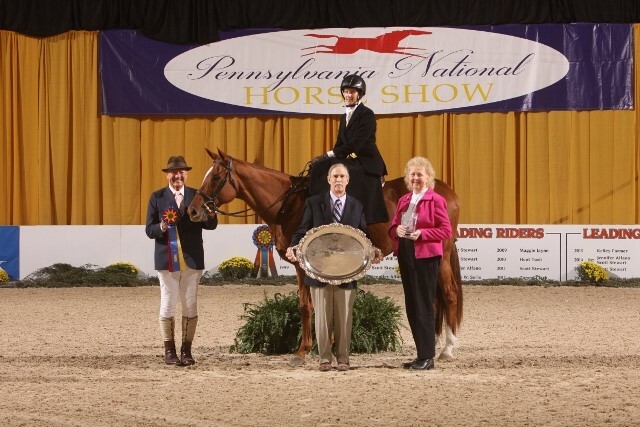 Amy Jo Magee of Coatesville, Pa., and Little Lady were named Reserve Champions. Glorioso and Turtle won both the Over Fences Class and the Hunter Hack Class to earn the title. "It's very special to win here," said Glorioso. "My horse was off the track so for him to come to a big venue like this is pretty great. A lot of people counted him out because he's not the flashiest horse, but for him to win here means a lot to me because I've trained him from the beginning." Scott Stewart and Dr. Betsee Parker’s Wonderly were awarded the Grand Green Hunter Championship and the Kimberton Hills Challenge Trophy for their performances in the 3’6” Green Hunter division at the Pennsylvania National Horse Show, presented by the Lindsay Maxwell Charitable Fund, at the Pennsylvania Farm Show Complex in Harrisburg, PA.
Harrisburg, Pa. - October 16, 2017 - Mr. Stewart's Cheshire Foxhounds of Coatesville, Pa., dominated Hunt Night, sponsored by Kinsley Construction, at the Pennsylvania National Horse Show, presented by The Lindsay Maxwell Charitable Fund. Riders of the Cheshire Foxhounds won three classes and received ribbons in all five events on Monday night to claim the championship title for the eighth time since the inception of Hunt Night. Jaden Porter and Dragonfly’s Acerado won the NAL Children’s Hunter Final and Jef Lauwers and Sutherland won the NAL Adult Hunter Final held during the Pennsylvania National Horse Show, presented by the Lindsay Maxwell Charitable Fund, at the Pennsylvania Farm Show Complex in Harrisburg, PA.
Harrisburg, Pa. - October 15, 2017 - Taylor St. Jacques,18, of Glen Allen, Va., captured the win in the Dover Saddlery/USEF Hunter Seat Medal Final, at the at the Pennsylvania National Horse Show, presented by The Lindsay Maxwell Charitable Fund. The victory was emotional as this was her last year of eligibility as a junior and therefore the last chance to win the Medal Final. "This is it. This is honestly a dream come true. I have always wanted to win a Final and hopefully we can win the rest and I can go out with a bang," said St. Jacques. "I thought the courses were great today. They tested enough without being too difficult. I thought from the moment my horse came out of the stall today he had his absolute "A" game on. He was ready to go out there and put his best foot forward and he did. He was absolutely incredible. I could not ask him to be better any part of any round." Family Fun Day at the Pennsylvania National Horse Show, presented by the Lindsay Maxwell Charitable Fund, was evident both in the main show ring and around the concourse as children and their parents enjoyed story hour, crafts, a petting zoo while pony hunters of all sizes and colors vied for championship ribbons. Harrisburg, Pa. - October 14, 2016 - Daisy Farish of Versailles, Ky., capped off a perfect week with a flawless performance on Alberto II, owned by Stoney Ridge Farm, LLC, to win the Neue Schule/USEF Junior Jumper Individual Championship at the Pennsylvania National Horse Show, presented by The Lindsay Maxwell Charitable Fund. Farish celebrated her 17th birthday on Thursday by taking top honors in the first phase of the Individual Championship. "This week has been surreal. My horse was so amazing and I'm so happy with him. I can't even believe it," said Farish. "This win means a lot to me, it's amazing. There are so many past winners who have gone on to do great things. It was also really special to finish on a score of zero. That meant a lot to me as well." Harrisburg, Pa. - October 13, 2017 - The team from Zone 7 ended a twenty-eight year losing streak to capture the gold medal in the Neue Schule/ USEF Prix des States Team Championship and Individual Championship Phase II at the Pennsylvania National Horse Show, presented by The Lindsay Maxwell Charitable Fund. Zone 5 won the silver and the bronze went to Zone 1. The last time Zone 7 was represented on top of the podium was in 1988, before any of the members were even born. This year's winning team consisted of Briley Koerner 17, of The Woodlands, Texas, riding For Jef VD Wezelse, owned by Bks Horse Farms, LLC; Anna Beth Athey, 17, of Enid, Okla., aboard Cantero Da Lagoa; Carson Grisham, 15, of Southlake, Texas on Zeros, and Brian Moggre, 15, of Flower Mound, Texas, on Condero 3, owned by DDM Equestrian, LLC. Martien Van Der Hoeven was the Chef d'Equipe. 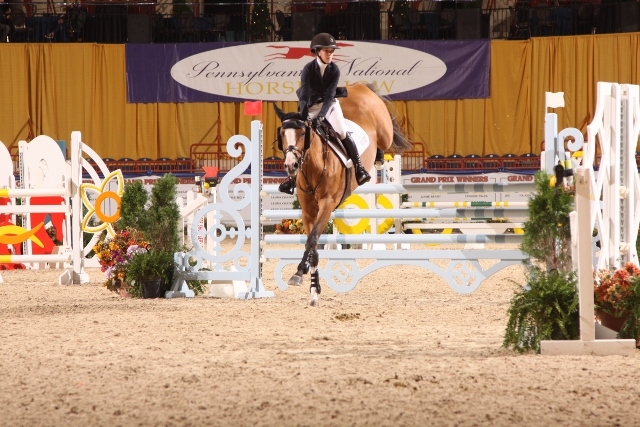 Hunters with their young riders competing in the Junior Hunter Divisions concluded on Friday, the second day of competition at the Pennsylvania National Horse Show, presented by the Lindsay Maxwell Charitable Fund. The Champion in the Large Junior Hunter 15 and Under Division was won by Augusta Iwasaki, Calabasas, CA, aboard Lyn Pedersen’s Small Affair. Iwasaki, 13, and the 14-year-old Selle Francais gelding claimed victories in three of the four classes in the division. For their spectacular efforts, Iwasaki and Small Affair were presented with the Irene L. Armstrong Memorial Perpetual Trophy, donated by the Bedard Family. Harrisburg, Pa. - October 12, 2017- Daisy Farish had the best birthday ever! The newly turned 17-year-old resident of Versailles, Ky. captured the win in the Individual Phase I of the Neue Schule/USEF National Junior Jumper Championship at the Pennsylvania National Horse Show, presented by The Lindsay Maxwell Charitable Fund. Riding Alberto II, owned by Stoney Ridge Farm, LLC, Farish saved ground at a fast clip to finish with 53.070 seconds in the faults converted into seconds one round speed competition. "This was definitely a good birthday!" beamed Farish. "My plan was to have a quick, clear round to help me later in the week and just to start off strong. It was a bonus to win the class. 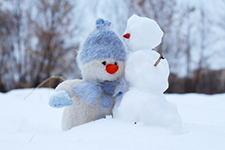 It was really great!" HARRISBURG, PA – The Pennsylvania National Horse Show Foundation is pleased to announce its first annual “Silent Auction” featuring goods, services and experiences from the over 70 on-site boutiques, area vendors and restaurants and Foundation supporters. HARRISBURG – The Pennsylvania National Horse Show is pleased to announce the availability of VIP seating and hospitality during the 72nd horse show, October 12 – 21, 2017 at the Farm Show Complex. 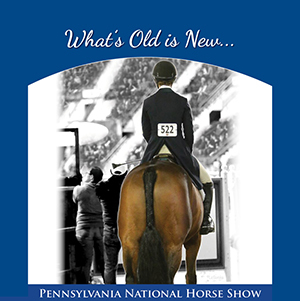 Harrisburg, Pennsylvania – June 21, 2017 – The Pennsylvania National Horse Show, presented by The Lindsay Maxwell Charitable Fund, has announced the list of officials for this year’s show which returns October 12-21 at the Pennsylvania Farm Show Complex and Expo Center in Harrisburg, the historic host venue since 1945. HARRISBURG, PA – The Pennsylvania National Horse Show is pleased to announce the details of the 2017 horse show schedule. Held over ten days from October 12 through October 21, 2017, this year’s show will again be organized into a “Junior Weekend” and a “Senior Week”. 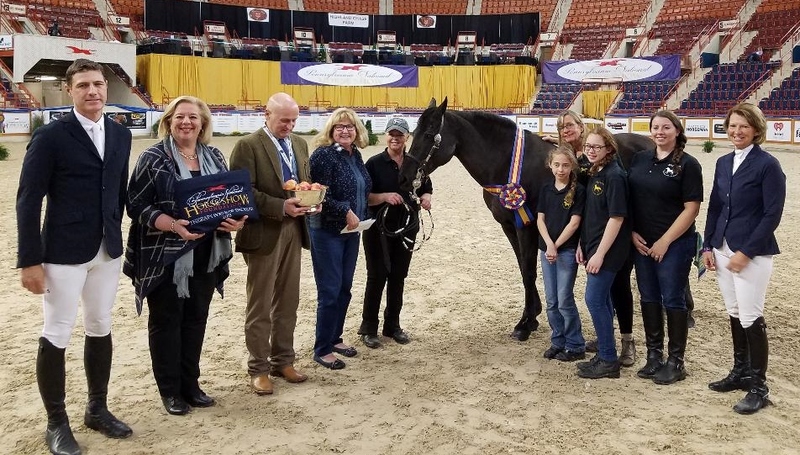 HARRISBURG, PA – Effective April 1, the Pennsylvania National Horse Show is pleased to announce the merger of its Association and 501c3 Foundation into a single entity, the Pennsylvania National Horse Show Foundation. The Foundation will maintain its established 501c3 status and all contributions and sponsorships will enjoy the tax benefits associated with the merger. 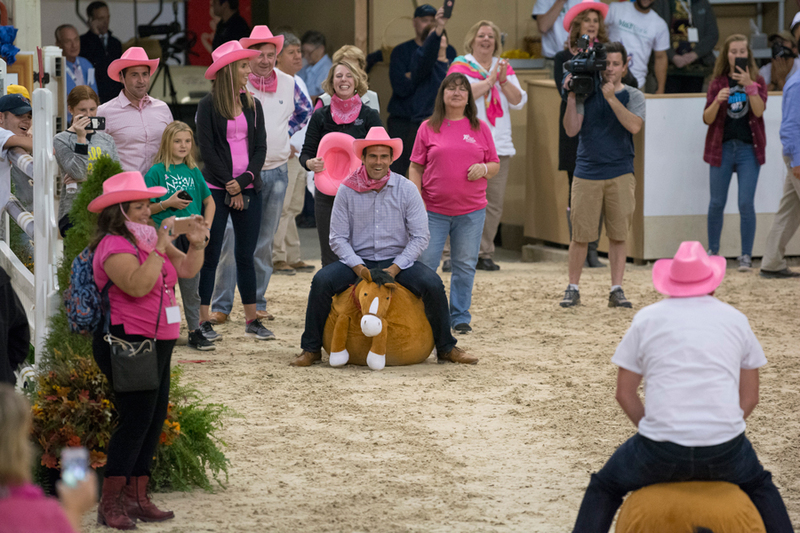 HARRISBURG, PA - The Pennsylvania National Horse Show Foundation is pleased to announce the return of “Foundation Friday” – a day dedicated to promoting the Horse Show’s 501c3 charitable Foundation and the groups it serves. 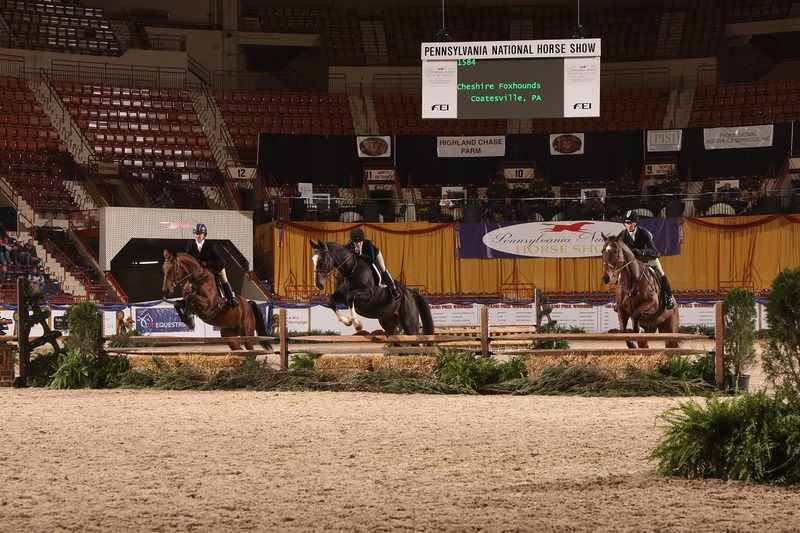 HARRISBURG, PA - The Pennsylvania National Horse Show Foundation is pleased to announce that grant applications are now available on the Foundation website, www.PAnational.org. The Foundation accepts grant applications through June 1, 2017 and makes awards throughout the summer. Harrisburg, PA.- For the first time in its 71- year history, the Pennsylvania National Horse Show Foundation held year end Therapy Riding Championships and awarded its first ever, Therapy Horse of the Year. Harrisburg, PA - October 22, 2016 - Katie Cox of Conroe, TX, and Hocus Pocus VH Hof Ter Heide, owned by KLC Investment Group, LLC, took home the blue ribbon in the $20,000 Under 25 Jumper Classic, the culmination of the inaugural running of the Under 25 division at the Pennsylvania National Horse Show, presented by The Lindsay Maxwell Charitable Fund. Hunter Holloway of Topeka, KS, was second on VDL Bravo S and Lucy Deslauriers, New York, NY, and Hamlet, owned by Lisa Deslauriers, was third. Harrisburg, PA – October 22, 2016 -- Daniel Coyle of Ireland capped off a great week at the Pennsylvania National Horse Show Presented by the Lindsay Maxwell Charitable Fund with a thrilling win on Fortis Fortuna, owned by Susan and Ariel Grange, in the $100,000 Prix De Penn National Presented by the Lindsay Maxwell Charitable Fund. Harrisburg, PA – October 22, 2016 – Emily Smith from Valparaiso, IN, and Morning De Reve were the only ones out of a field of 24 to post double clear rounds to take first place in the $5,000 North American League (NAL) Low Junior/Amateur Owner Final at the Pennsylvania National Horse Show presented by the Lindsey Maxwell Charitable Fund. Harrisburg, PA - October 22, 2016 - In only his third year of riding, Dean Dignelli, 27, Katonah, NY, captured the win in the North American League (NAL) Adult Jumper Finals, presented by Smartpak, riding Redefin, owned by Heritage Farm, at the Pennsylvania National Horse Show, presented by The Lindsay Maxwell Charitable Fund. Phoenix Cooke, Chardon, OH, and Skys Burnin Blue were second and Joy Slater, Unionville, PA, was third on Oilean Uno, owned by Fat Chance Farm. Harrisburg, PA – October 22, 2016 – Bailey Doloff, Sykesville, MD, who just turned 18, and his little dynamo, Wishlea Star Dasher, took the win in the $10.000 North American League Children’s Jumper Final sponsored by Equifit at the Pennsylvania National Horse Show presented by the Lindsey Maxwell Charitable Fund. 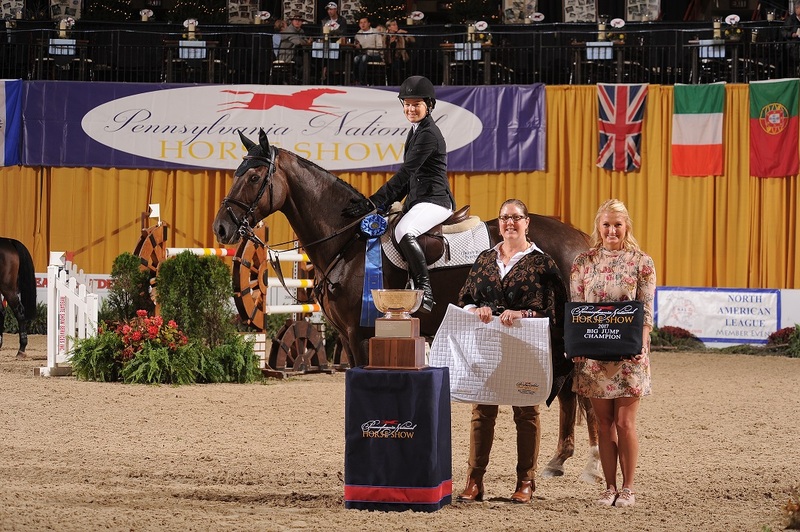 Harrisburg, PA – October 22, 2016 – Shaw Johnson Price, of Chestertown, MD, rode her Custom Made to victory in the Amateur Owner Hunter Riders 36 and Over and gained not only the division Championship, but the Grand Amateur Owner Hunter title at the Pennsylvania National Horse Show presented by the Lindsey Maxwell Charitable Fund. 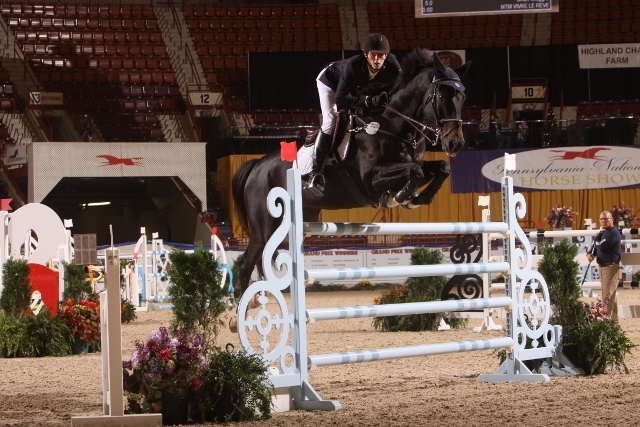 Harrisburg, PA - October 21, 2016 - Leslie Burr-Howard, Darien, CT, locked up two consecutive victories at the Pennsylvania National Horse Show, presented by The Lindsay Maxwell Charitable Fund, winning the $35,000 Keystone Classic, sponsored by Harvest Seasonal Grill and Wine Bar, with Donna Speciale, owned by Sudreau and Howard. For the second consecutive night, Irish rider Daniel Coyle took second place, this time on Tienna, owned by Susan Grange. Harrisburg, PA – October 21, 2016 – Friday night, the Pennsylvania National Horse Show, presented by the Lindsey Maxwell Charitable Fund, opened the in-gate to the coliseum, and their hearts, to honor some very special horses and their riders, and one extraordinary horse, in particular, as Therapeutic Horse of the Year. Harrisburg, PA – October 21, 2016 -- Jaime Auletto, who hails from Philadelphia, PA, and Carla, who is owned by her mother, Suzanne, were named Amateur Owner 3’3” Grand Hunter Champion at the Pennsylvania National Horse Show presented by the Lindsey Maxwell Charitable Fund. Harrisburg, PA - October 20, 2016 - Less than a blink of an eye separated the top two in the $40,000 Pennsylvania "Big Jump", sponsored by Wilmington Trust - A Division of M & T Bank. Leslie Burr-Howard of Darien, CT, and Quadam, owned by Laure Sudreau, triumphed over Irish rider Daniel Coyle and Ridley, owned by Susan Grange, by 1/100th of a second in the first of three FEI events to be featured at the Pennsylvania National Horse Show, presented by The Lindsay Maxwell Charitable Fund. 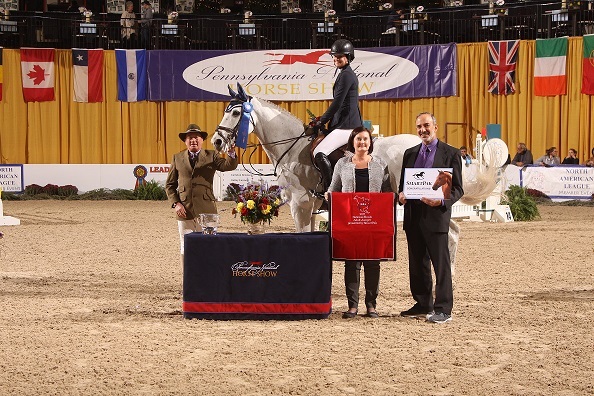 Harrisburg, PA – October 20, 2016 – Fun and Scott Stewart made multiple trips to center ring at the Pennsylvania National Horse Show, presented by the Lindsey Maxwell Charitable Trust, picking up awards for Champion Green Conformation Hunter, Grand Champion Hunter and Leading Hunter Rider. Harrisburg, PA - October 19, 2016 -Andrew Kocher was just hoping to have a couple of clear rounds in the $10,000 Dash for the Cash at the Pennsylvania National Horse Show, presented by The Lindsay Maxwell Charitable Fund. The State College, PA, resident never thought those rounds would be good enough for first and second place in the Wednesday night Open Jumper class, sponsored by Geraldine Nesbitt. 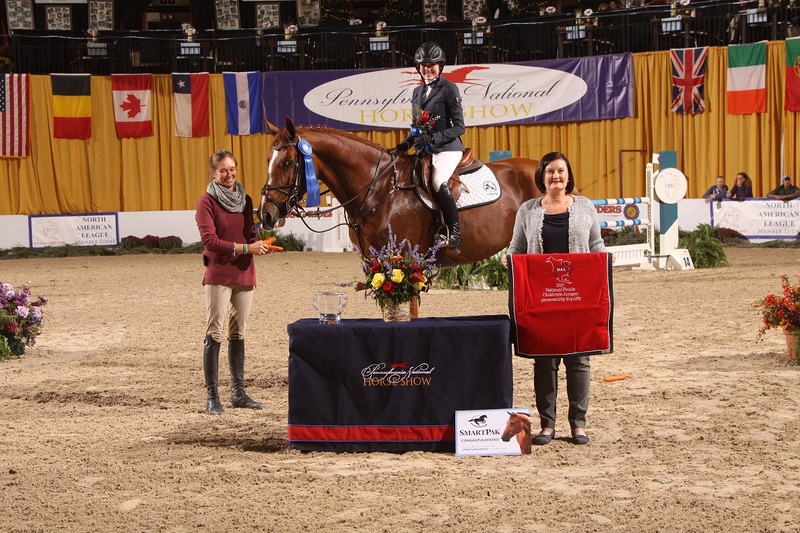 Harrisburg, PA – October 19, 2016 – Jennifer Hannan and Best Regards, owned by Patricia Fulchino, won the $15,000 USHJA Pre-Green Hunter Incentive Stake at the Pennsylvania National Horse Show presented by the Lindsey Maxwell Charitable Fund. Harrisburg, PA - October 18, 2016 - Amy Jo Magee, Coatesville, PA, and Little Lady captured the Championship in the Sidesaddle Division, sponsored by Mr. & Mrs. Richard L. Hornberger, at the Pennsylvania National Horse Show, presented by The Lindsay Maxwell Charitable Fund. Seeya Layta, owned by Sharon MacDonald and ridden by Jocelyn MacDonald, were the Reserve Champions. Harrisburg, PA – October 18, 2016 – Catch Me, a 9-year-old grey gelding, gets to add his name to an illustrious list of horses, including Riot Free and Showman, who have won the Grand Green Hunter Championship and the Kimberton Hills Challenge Trophy at the Pennsylvania National Horse Show presented by the Lindsey Maxwell Charitable Fund. Harrisburg, PA - October 17, 2016 - Farmington Hunt Club of Charlottesville, VA, defeated nearly two dozen teams to take home the Hunt Night Championship at the Pennsylvania National Horse Show, presented by The Lindsay Maxwell Charitable Fund. The club traveled four and a half hours to participate in the popular event. Harrisburg, PA – October 17, 2016 – Amateur rider Samantha Ruttura, from Lloyd Harbor, NY, and her 8-year-old horse Quinn, won the coveted North American League (NAL) Adult Hunter Final at the Pennsylvania National Horse Show, presented by the Lindsay Maxwell Charitable Fund. Their two round score of 167.0 garnered them the blue ribbon and the coveted Lisa A. H. Cudahy Perpetual Trophy. Harrisburg, PA – October 17, 2016 -- Alexandra Cain, 17, from Olney, MD, and Camille owned by Louna Primm, were judged the best in the North American League (NAL) Children’s Hunter Final held at the Pennsylvania National Horse Show presented by the Lindsay Maxwell Charitable Fund. Their two round score of 161.50 gave them the top award and the coveted Laura Palmer Pickett Memorial Perpetual Trophy for 2016. Harrisburg, PA - October 16, 2016 - T.J. O'Mara was in disbelief after taking top honors in the Pessoa/US Hunter Seat Medal Final, presented by Randolph College, at the at the Pennsylvania National Horse Show, presented by The Lindsay Maxwell Charitable Fund. The 17-year-old Rumson, NJ, resident moved up from fifth to first to win the coveted title. 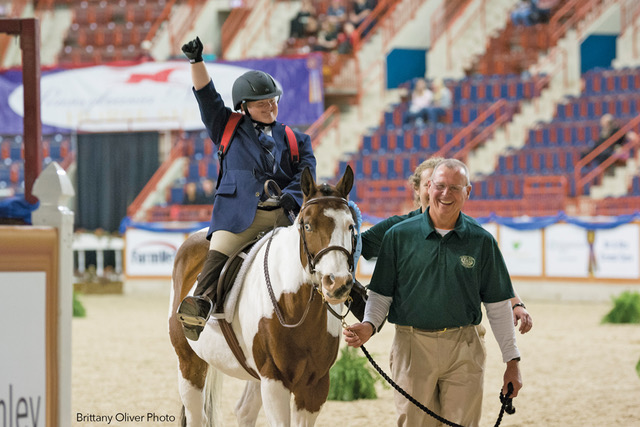 Harrisburg, PA – October 15, 2016 – Pony Hunters of all sizes took over the ring at the Pennsylvania National Horse Show presented by the Lindsay Maxwell Charitable Trust. The ponies and their pint-sized jockeys contested two over fences classes on Friday, and on Saturday saw the culmination of their efforts, with a class on the flat and one final round over fences to determine championship honors. Harrisburg, PA - October 15, 2016 - In a nail biting fight to the finish, Katherine Strauss, 17, of Southampton, NY, took top honors riding All In, owned by Katherine Strauss, LLC, in the Neue Schule/USEF Junior Jumper Individual Championship at the Pennsylvania National Horse Show, presented by The Lindsay Maxwell Charitable Fund. The win was all the more special as she was competing in her final year as a junior rider. Harrisburg, PA - October14, 2016 - The team from Zone 2 took home the team gold for the second consecutive year with the best possible score to win the Neue Schule/ USEF Prix des States Team Championship and Individual Championship Phase II at the Pennsylvania National Horse Show, presented by The Lindsay Maxwell Charitable Fund. Zone 4 won the silver and the bronze went to Zone 5. Harrisburg, PA - October 14, 2016 - Brett Burlington, 17, of Miami, FL, and the Popish Farm entry, Due West, were awarded the Championship in the Large Junior Hunter 16-17. 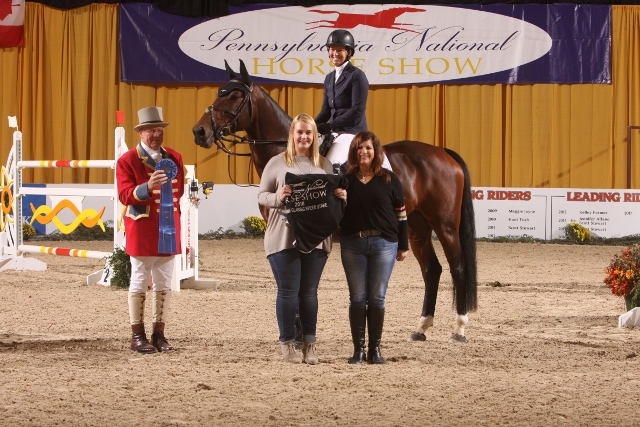 They amassed a total of 26 points over the two days of competition to earn the title at the Pennsylvania National Horse Show, presented by The Lindsay Maxwell Charitable Fund during the prestigious Junior Weekend of competition. Bergen Sanderford and Happenstance took the Reserve Champion title with 24 points. Harrisburg, PA - October13, 2016 - Sophie Simpson and Why Not intimidated the competition jumping fast and fault-free early in the lineup to win the Individual Phase One of the Neue Schule/USEF National Junior Jumper Championship at the Pennsylvania National Horse Show, presented by The Lindsay Maxwell Charitable Fund. Harrisburg, PA – October 13, 2016 – Junior Weekend is off to and running at the Pennsylvania National Horse Show with Junior Hunters competing in the first of their classes to determine champions for 2016. Harrisburg, Pennsylvania (October 12, 2016) — Today, during an official ribbon cutting ceremony, the Pennsylvania National Horse Show (PNHS) joined Pennsylvania Secretary of Agriculture Russell C. Redding and other Central Pennsylvania leaders to celebrate the beginning of one of the nation's most prestigious, premier equestrian competitions at the Pennsylvania Farm Show Complex.